Here is a quick tutorial on How to Lock Windows 8 Screen. Well, you must be thinking that locking Windows 8 is so very easy and quick, must be the way we have been doing in other OS. But, let me tell you, it not. Yup…locking Windows 8 requires a little learning as it is very much different from how we have been locking other OS including Windows 7, Windows 8, and others. By locking your PC, I mean you are locking the screen so that no one can access you PC while you away from your desk. The system remains signed-in and displays a lock screen. However, to open the lock screen, you have to enter your confidential password. Locking Windows 8 screen remains the programs running normally and it doesn’t enter a different power state. After a quick R&D, I found three different methods of locking Windows 8 screen. Type CTRL + ALT + DEL and select lock menu from the option. Open the Start screen, click user-tile given at the top right-side, and select “Lock” from the menu that appears. Yup…you have successfully locked your Windows 8 screen. Isn’t that so easy, however needs a little guidance. 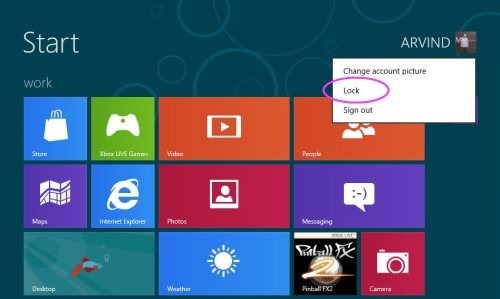 Also, check out our post on How To Sign-out from Windows 8 Account. I found the last method most beneficial and quick. You go ahead, try out the methods and leave us in comments as to which one did you like the most…! win + L is neat – cheers for that!